But smock is also the name of a particular style of dress that is gathered at the waist, neckline, or at the sleeve. Sometimes where the dress was "smocked," there is embroidery as well. When you look closely at the Smock chairs, you can see the intricate smocking of the fabric in several layers near the "sleeves," or "armholes," of the furniture, redolent of a very charming, comfortable, detailed frock... perhaps, one made by your grandmother. 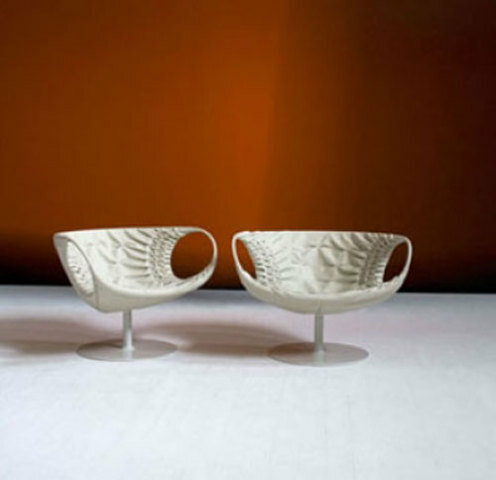 The simple oval lines and sculpted openings in the chair, though very clean and industrial looking, create a welcome (convivio!) frame for the smock material, whether fabric or leather. 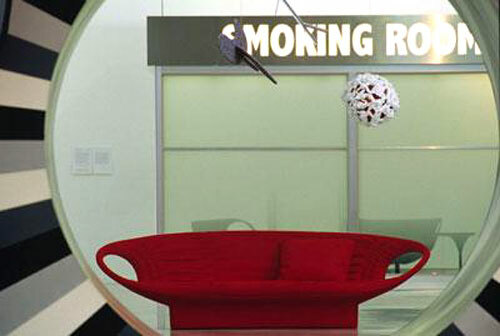 I guess that's why Moroso made and donated gold Smock armchairs to Convivio 2008 , an exhibition at the Fiera Milano City, June 13 - 17, 2008. The benefactor of the proceeds of Convivio 2008 will be Anlaids, an international AIDS non-profit organization. Oh! Forgot to tell you. 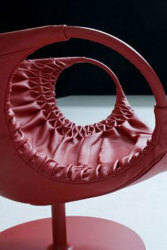 Moroso also makes a Smock sofa! Readers: Today's blog marks my move from All About Taste, a food and kitchen blog, to Design UnLeashed. I may pop into the kitchen from time to time, but now I have the run of the house! Best Electric Juicer For The Price? We've Got Two! Looks more like a diaper to me! I agree! That's what I was thinking.